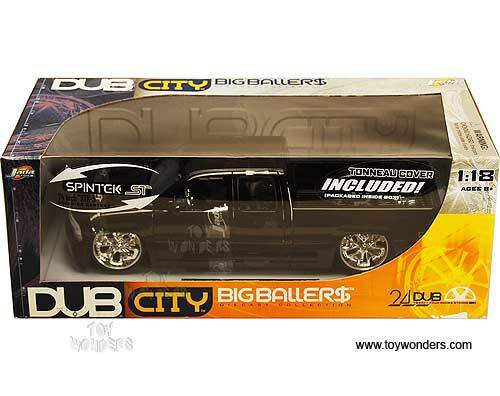 63112B5 JADA Toys DUB City - 2002 Chevrolet Silverado pick-up truck. 1:18 scale diecast model car. This Chevy Silverado pick up is 12.25" long x 4.25"W x 3.5"H, free wheel, diecast metal with openable doors, hood & tailgate. The '02 Chevy Silverado features chrome steering wheel, sound system, hydraulic system, video game system, Spintek STK-5 rims, and custom floor mats. Sits on plaque. Street low rider. Big Ballers styling. This DubCity Silverado pickup truck is manuafactured by Jada Toys. Dubcity. 63112 in BLACK color. Individually packed in a window box. GM is a trademark of the General Motors Corporation. To see other Chevy Pickups (click here). 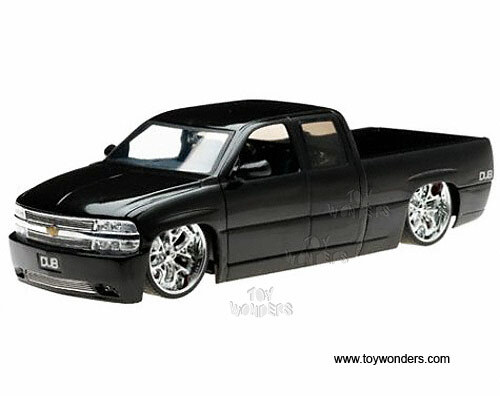 To see more Chevy Silverado collector die-cast models (click here).